The series of volumes on the archbishops of Canterbury, which began life with Ashgate and has now passed to Routledge, reaches its eighth volume with that under review from Michael Hughes, which does not disappoint. 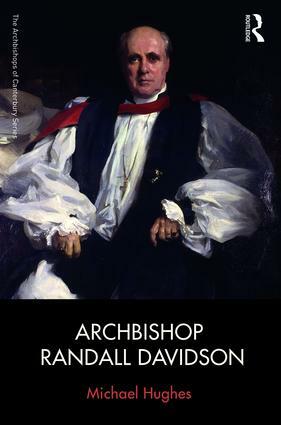 Randall Davidson is the third of the twentieth century archbishops to be so treated (the 2015 volume on Michael Ramsey was the work of this reviewer), and the book adopts a similar approach to the others. The bulk of the book is taken up with a consideration of Davidson’s tenure as archbishop of Canterbury, which ran from 1903 until his retirement in 1928 at the age of 80. The final section of the book consists of selected primary sources, arranged and annotated to illustrate the themes of the first part of the book. The volume makes no claim to be a biography of Davidson in the formal sense. George Bell, later bishop of Chichester, was chaplain to Davidson as Davidson himself was to A.C. Tait, and all students of Davidson labour under the shadow of Bell’s massive biography, which went through three editions between 1935 and 1952. Hughes wisely makes no attempt to replicate in 140 pages that which Bell detailed in 1,000 pages, but rightly observes (2-3) that Bell’s work is difficult to use by dint of its length; it is notably discreet about matters that are now usefully laid bare, and the Davidson that emerges from Bell’s account is coloured both by Bell’s closeness to the events described, and the part he himself played in some of them. By and large, as Hughes notes, Davidson has slipped from memory, including that of the Church of England itself (171), his reputation eclipsed by other figures such as William Temple or Michael Ramsey who appeared to make a more spectacular impact. The time is right for a fresh and concise assessment of Davidson as archbishop, which Hughes provides abundantly. Although Davidson seemed to have solved few problems and to have left few permanent monuments to himself in institutional form, Hughes shows that Davidson’s achievement in steering his church through turbulent times is one to be reckoned with. The book will be a useful starting point for studies of Davidson himself, and of the religious history of the period in general, and should be read by established scholars as well. The introduction outlines Davidson’s progression to Lambeth Palace as a means of explicating his approach to the role. Like many bishops of the Church of England, he was first chaplain to the archbishop (in this case, A.C. Tait, between 1876 and 1883), a role something like a private secretary or executive assistant in other contexts, in which a young clergyman of promise could learn the inner workings of the bureaucracy. Next came six years as dean of Windsor, in which role Davidson became a close confidante of Queen Victoria. This was to continue as first he became bishop of Rochester, and then of Winchester (1895), in which diocese lay the royal residence of Osborne House on the Isle of Wight. These connections – with the Queen, with successive archbishops, and with the political class as they met in Parliament and in the gentlemen’s clubs of London – meant that when archbishop Frederick Temple died in office at the end of 1902, Davidson was the obvious choice to receive the nomination of Prime Minister Balfour. The word ‘courtier’ was used of him as the appointment was announced, and not kindly (p.29), but although the term captured something important of the circles in which he moved, it implied a subservience that Hughes shows was not characteristic of Davidson as archbishop. In his 1971 survey of the archbishops of Canterbury, Edward Carpenter, dean of Westminster, described Davidson as ‘the last of the Victorians’. Hughes takes up this theme, which permeates the book: of Davidson as a Victorian figure confronted with great changes both within the Church of England and in the nation at large. Within the Church, Davidson had to deal with tensions between the Anglo-Catholic and Evangelical wings of the Church and the challenge of maintaining discipline, using the device of a Royal Commission to dampen down the heat generated by the issue of irregularity in public worship. Davidson was reluctant to create what became the 1922 Commission on Christian doctrine to investigate the issues raised by ‘Modernism’ in theology; he doubted that it could be constituted in a way that could command trust across the whole spectrum of opinion, and feared that the most likely result was greater discord rather than less. Hughes shows that although he could identify the issues that were at stake, Davidson was temperamentally incapable of grasping the depth of feeling that such questions provoked in others. Few accused Davidson of partisanship; rather more, indeed, wished for greater firmness and a clearer conviction. But there was a conviction in Davidson, despite what some thought: that most issues of controversy could be dealt with by calm, patient reasonable men if they were only able and prepared to set aside their own self-interest; there were few things worth fighting over. It was a remarkable achievement to have steered the revised Book of Common Prayer through the decision-making processes of the Church, given that (as Davidson himself noted) there were those ‘who have given their thoughts to the structure of a service which to many of them means more than anything else on earth.’ (158) However, Davidson’s shock when Parliament rejected the revised Book as a threat to Protestant England showed that, even if he could conceive intellectually that such feelings might exist, they were beyond him fully to understand. What of the Church and the society and nation around it? Successive archbishops have intervened in national affairs to a greater or lesser extent, and Hughes’ account reveals Davidson as rather more reticent to appear ‘political’ than his successor William Temple (already bishop of Manchester from 1921), or Michael Ramsey rather later. He was most comfortable when intervening in matters that might be termed strictly ‘moral’, such as the broadening of the grounds for divorce in the Matrimonial Causes Bill of 1920 (139), or the use of poison gas or reprisals against civilian targets during the 1914-18 war. He was rather less prepared to commit himself publicly on other issues, such as women’s suffrage or foreign affairs. This was in part due to a reluctance to speak on issues of which he did not have a detailed knowledge, and the Church of England did not yet have staff whose role it was to formulate a position on this or that issue of the day (that structure was to be erected later). It was also partly because Davidson thought that to appear too ‘political’ was likely to damage the position of the Church; the Church’s influence was greatest in private, and the channels through which it might be exerted might well close to him should his public voice be too definite. Davidson thus tried to mediate in relation to Irish Home Rule, and offered to do the same during the coal strike of 1921. His fears were confirmed when he called for simultaneous concessions from both sides in the General Strike of 1926 and was vilified for his pains. More fundamentally, Davidson’s cast of mind was not systematic, not given to abstract analysis of social forces: if there were social problems, he tended to see them in terms of the failings of individuals which could be amended by persuasion and renewed personal effort. He was largely impervious to the more systematic analysis of social and economic systems that fired Temple and others exercised by the ‘social gospel’. This pragmatic, concrete tendency in Davidson’s thought is most visible in his understanding of the relationship between church and state, which was thrown in such confusion during the Prayer Book Crisis. It would be too easy to dismiss Davidson as subservient, a mere member of the ‘Conservative party at prayer’ (to use the phrase of Maude Royden). In private, Davidson was often ready to press politicians on a moral course of action, and also to defend the interests of the Church itself against the state. As in the case of his support for the restraint of the House of Lords in the Parliament Act of 1911, he was wise enough to realise that it was not possible to hold out against all efforts at change. But his whole career was conditioned by an attachment to the place of the Church within the constitution. For Davidson, there was a givenness to the Establishment of the Church, based on his reading of the evolutionary character of English history; he thought it also of positive benefit to both church and state that they should be so related. But in 1927-8 the state, in the shape of the House of Commons, exercised what were undoubtedly its powers in law to override what was taken to be a tacit agreement that the Church should be in fact be independent in the matter of its worship. Davidson’s whole career had been spent in the quiet maintenance of a fine balance between the church and the state, based on tacit understandings developed over centuries. As Hughes notes, ‘such unwritten rules only had authority as long as they were acknowledged by those to whom they supposedly applied’ (163). Davidson was the ecclesiastical consensus politician par excellence. By the time he retired, such consensus was in short supply in British public life. Within weeks he had resigned. All this is expertly described with concision, and no little elegance, and Hughes’ judgments are measured yet telling. It is no pleasure, however, to report that the transition of the series from Ashgate to Routledge has coincided with a marked reduction in the quality of the book as an object. The print quality is frankly poor and the increased amount of text on each page gives the whole a cramped feeling. Footnotes are placed at the end of each chapter, surely the least usable referencing method of the many available. All serious libraries for history and theology will wish to have a copy, which is just as well since the astonishing price of £105 surely puts the volume out of the reach of practically all individual readers, while others in the series have a paperback edition at a quarter of the price. This is a shame, since Michael Hughes’ fresh and convincing rendering of an important figure deserves a wide readership.